When it comes to house hunting, Kim Sliney is the first to admit she can be picky. The 46-year-old interior designer just couldn’t see herself living in small, chopped-up rooms. Or being happy in boxy interiors adorned with blah bathroom tiles and Formica counters. After visiting—and vetoing—37 houses, the single mom from Exeter, R.I., happened upon her just-right fit: a newly built, $350,000 home that boasted a spacious-feeling layout, killer walk-in closets and custom details like crown molding, granite countertops and a gas fireplace—for no extra charge. How did she stumble into this particular development? She was driving around in the area and saw a woman-centric sign on the entrance. “It was very intriguing,” says Ms. Sliney. Men may think they run the world, but it’s women who are now getting the royal treatment from the housing industry. Indeed, say housing market watchers, builders are now strenuously working to win the hearts—and checkbooks—of female buyers. And with the economy punishing the sexes unevenly, single women have become an especially important force to be reckoned with in real estate. According to the National Association of Realtors, they now sign on the dotted line in nearly a quarter of all U.S. home deals—up from 14% in 1995. One day soon, finding a real estate agent to help you house-shop may be as close as a Stop & Shop supermarket. 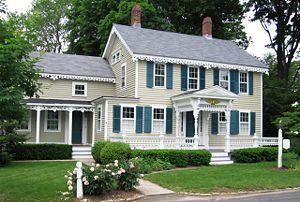 While you’re there to grab some bread and a head of lettuce, you’ll be able to shop for a spacious colonial or renovated ranch, courtesy of the ‘micro offices’ real estate brokerage RE/MAX is installing in as many as 17 New England Stop & Shops, including one in Connecticut. uch retail partnerships provide consumers the opportunity to conveniently purchase items and services they use regularly, said Scott Testa, marketing expert and business professor at Cabrini College in Philadelphia. But the partnership between RE/MAX and Stop & Shop is is a bit odd, Testa said. Despite that, Testa said he can see consumers browsing listings if they are displayed in a way that doesn’t necessarily require interaction with a real estate agent. “It’s all in how it’s presented,” he said. If the lousy economy has got you struggling to make your mortgage payments, there’s a good chance you’ve entertained at least a passing fantasy about turning in the keys and closing the door on your housing woes. One group that has caught on to the financial sense of walking away is retirees. Some elderly homeowners who borrowed against homes in the Northeast to buy second ones in Florida have been allowing their older homes to fall into foreclosure, notes Scott Testa, a business professor at Cabrini College in Philadelphia. That strategy makes sense, however, because Florida’s homestead exemption law prevents creditors from forcing the sale of in-state properties.